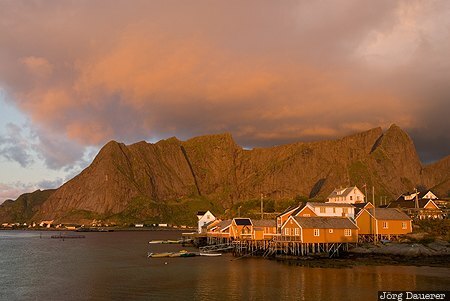 Warm morning light illuminates the yellow rorbuer huts of the tiny village Sakrisøy and the mountains in the background below colorful sunrise clouds. Sakrisøy is on the island Moskenesøy which is part of the Lofoten archipelago, Nordland in northern Norway. This photo was taken in the morning of a sunny day in August of 2010. This photo is in the Photo Calendar "Norwegen". This photo was taken with a digital camera.